Well, day 2 at the 232nd AAS meeting in Denver is done and I can attempt a brief summary of some of the topics. But first, since we all like astroimages, and I didn't bring a scope to Denver, but I did have my cell phone during my earlier dark sky visit with Searching for Gravity Waves, Dr. Gary. 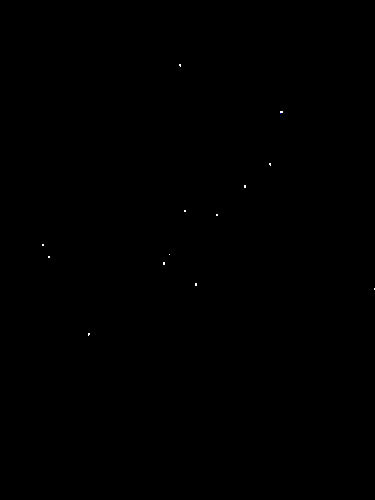 So, I can offer this one image of the Big Dipper, which I was quite surprised to see because I hardly ever am able to see it in Los Angeles. 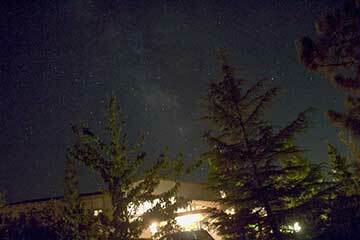 So, I could make out the Big Dipper with my own eyeballs and this is the cell phone image. I used Photoshop to stretch the contrast between light and dark. I tried taking a cell phone image through the eyepiece of Gary's telescope, but I was not coordinated enough to keep the cell phone camera centered over the eyepiece and still push the shutter button. Ok, that sad tale is all of the astroimages, so back to the AAS meeting! Perhaps the most exciting session that I attended was the plenary session presented by Professor Gurtina Besla, U. of Arizona, who told us about "The Dynamics of the local group in the era of precise astrometry." The release of data from the Gaia probe is starting to revolutionize our understanding of astronomy because for the first time old common accepted ideas about the Milky Way and our local group of galaxies can now be tested and verified or not. The recent 2nd data release from Gaia means that position and velocity data for something like a billion stars is now available. With this new data set, it is possible to more accurately check the flow of stars and to back integrate and forward integrate their paths and be able to see where the groups of stars have come from and where they are going in the future. Professor Besla outline some of the preliminary findings, with the papers still being in preparation. For instance, previous estimates of Andromeda's collision speed approaching the Milky Way were based only on radial velocity between the two objects because the transverse coordinates could not be measured. Now the transverse components are available from Gaia. In addition, it seems that many of the satellites of the Milky Way, like the LMC and SMC, have now almost certainly have been found to not have a history of orbiting the Milky Way ever since its formation, but instead this is really the first approach of the SMC and the LMC. So many more findings are going to come out of the analysis provided by Gaia that this is going to be an exciting and revolutionary time in astronomy! I also sat in on a couple of sessions covering the airborne observatory, SOFIA, which flies high enough to get above about 98% of the IR absorbing atmosphere, and can make astronomical IR observations. I paid especial interest in these sessions because after the COSPAR conference in Pasadena next month, I was lucky enough to sign up for a tour of SOFIA. Too bad it will just stay on the ground at the airport, but at least I will get to see what it is like. One presentation by Elisabeth Mills, Boston U., was one SOFIA observations of the gas near the center of the Milky Way, within about 100 pc of Sgr A*. The Sgr A* black hole is observed to be relatively quiet and not feeding on the surrounding gas and the question is what processes determine when black holes feed. There are stars and gas clouds that appear to be in stable orbits about the black hole and it is not clear what and when the feeding on the gas starts and stops, as the feeding is observed in other galaxies which have active galactic nuclei (AGN). So the researchers are trying to get increased resolution images, which can see past the dust which stops optical imaging, and determine what is going on. We know that in order for the orbiting gas to fall into the black hole it has to lose energy and angular momentum by some process. In the last post of June 5, I mentioned the Chandra X-Ray Center developed virtual tour through the Cassiopeia A supernova remnant and showed an image of it. Now, I have not yet tried to spy Cas A through my scope, but have come to find that the remnant is about 300 years old and there is some controversy regarding whether the initial event was observed by some astronomer at that time or not and another controversy is whether supernovas leave other evidence of their occurrence, in this case in ice cores. The idea was that supernovas, sort of like solar storms from the sun now, bring a lot of ionizing radiation and particles to the Earth and these could produce excess amounts of nitrates, which since they are preferentially formed and delivered to the Earth surface near the magnetic poles, this could explain the peaks of nitrates found in historical layers in ice cores recovered from Greenland and Antarctica. Wow, that would be neat! We know that ice cores record all sorts of evidence about climate and volcano activity, but, I don't get the sense that this issue is settled. In fact there are some reports that even trying to trace solar activity today, which can also create nitrate spikes, cannot be relied on to indicate solar activity, so I will leave it to you to report on any new evidence regarding the indication of supernova events. 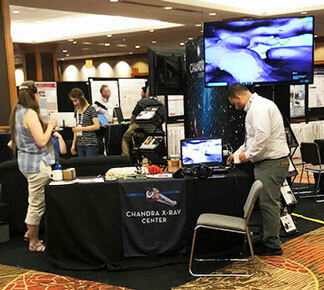 When I returned to the Chandra booth, I asked a couple of astronomers that were there what they thought of using ice cores to track supernova events, none of them had every heard of it. Hmm, is it due to the specialist nature of scientists or is it due to the concept not really being part of real science? Cosmic rays are another visitor from the cosmos that arrives and the Earth and they too leave evidence of their impact. So, I sat in on a couple of technical sessions covering such topics as the astrophysical source of cosmic rays. You will recall that in a previous March 21, 2018 post, I showed a plot of cosmic ray intensity versus energy and how the plot resembles a leg with breakpoints at the "knee" and at the "ankle". These breakpoints seem to indicate some transition from one process that generates cosmic rays to another different process. This concept is sort of what I recall hearing in some of these sessions. It seems that supernovas are part of the likely source of high energy cosmic rays as well as merging black holes. It seems that merging black holes are thought to generate large magnetic fields which can accelerate particles, that are fortunate enough to escape, which turn out to be cosmic rays. It is pretty complicated stuff and need to go back and review my astrophysics book that talks about some of these processes. Ok, that is about enough for day 2 comments. 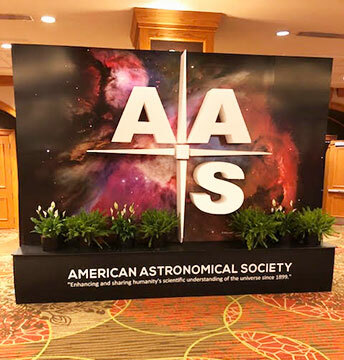 Except on my way out of the ballroom, I walked by this AAS sign again and want to encourage everyone else to take advantage of the huge amateur astronomer discount so that you could be here too! There is a growing need for and recognition of citizen scientists to help out in many different ways to help do real science. Besides, it's just fun to see what is going on in astronomy.